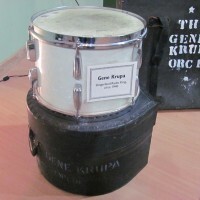 Here’s a few cool drum items that belonged to Gene Krupa. 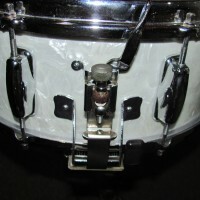 First is a 13″ Slingerland Radio King tom with a Gene Krupa Orchestra case. I got this from an older guy in his late 70s about 20 years ago. 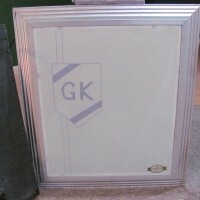 He told me his friend stole it off of the loading dock at the Trianon Ballroom in Seattle in the late 40s or early 50s after a Gene Krupa Orchestra show there. He never knew what to do with it because as much as he loved it, it was stolen from his idol. It sat in his garage all those years until he finally took it into a little consignment shop when he was clearing out his garage. 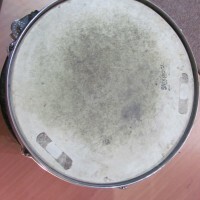 Check out the marks on the tom from the Band Aids he was using for muffling. 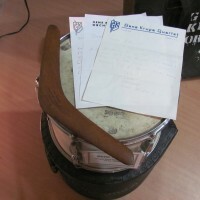 This was one of the first drums in my collection.